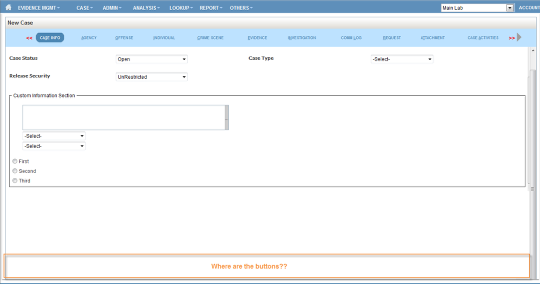 Bottom of the Main Case View in LIMS-plus v5 is Missing – Welcome to JusticeTrax Customer Care! Using Internet Explorer 9, there are times when you enter a main case view (either an existing case or adding a new case) and you do not see the bottom of the screen including important information like the Submit button. You can't create a new case if you can't click submit. Does your main case view Case Info tab look like the picture below? You should see information at the bottom of the case info tab including the Submit button if this is a new case. Correct the issue by changing an Internet Explorer 9 setting. 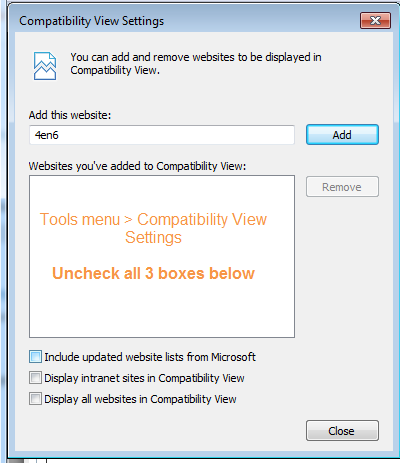 In Internet Explorer 9 from the Tools menu, click Compatibility View Settings. Make sure all three check boxes at the bottom are unchecked. The bottom of the main case view screens will now appear as expected.